We all need to be beaten into shape. Life will deal us blows. And it rarely happens when we are all alone, although it happens most when we feel we are all alone. Huge difference there. The blows of intimidation, anger, accusation, rejection, disappointment, betrayal. Some get these blows direct, hard, often. Most get them on occasion. Sometimes the blows aren't enough to kill us, but they are slowly destroying our zeal to live. What we don't realise enough though is that we serve out those blows too. And it doesn't just happen when we are the direct agents causing the hurt. It can happen too when instead of being an anvil, we become a pickaxe (or ice pick or whatever you fancy). 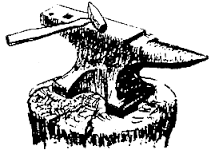 The anvil is what a piece of metal to be shaped sits on. It is strong, solid and takes the blows with the poor metal being beaten into shape. without the anvil to rest on, the work does not get done. There is no stronger substance to absorb the blows. The anvil also has various parts that help to get the metal beaten into the right shape - to add a curve, to punch a hole. The pickaxe or ice pick on the other hand works by striking and breaking a large piece up. If you are prone to analysis, love perfection, cannot stand uncertainty - this profile probably fits better. Situations, people, crises are all taken apart in your mind and heart; and comes tumbling out in words and mannerisms. Also, as most of us have become so used to being picked on; by parents, teachers, peers, even the media - it is the easier skill to imbibe. J: Why? What did you do? Are you sure the worry is valid? So it's easy to be a pickaxe. Yet, those same experiences and my efforts to make it safely through a treacherous world have given me an empathy and mercy that is deep as it is easy. So I can be an anvil. I am writing this because just recently i felt the painful jabs of a pickaxe - again. My initial response was to pickaxe back - even if I mostly do it within me. But time and many painful episodes have taught me it is a rather futile regiment. I do not ignore my pain or gloss over my sadness. I take it to the One Anvil I know who can take all the blows. I trust Him to accept the blows with me and in His Silent Sovereignty to direct those blows so that they shape me up and not smash me apart. It is hard to not react when you sense danger or feel alarmed. It is hard to not despair when in a moment all that you thought was in the past come rushing back. It is hard to not fantasize of another world, another time and drug yourself with false hopes. The metal being beat sees that threatening pickaxe or hammer coming down and it must be terrified ! But it is not destroyed. For it sits on The Anvil.